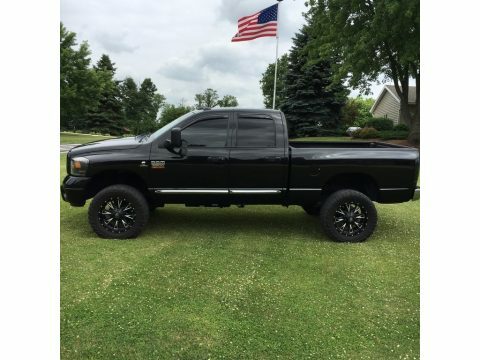 2008 Dodge Ram 2500 Laramie For Sale in Random Lake, Wisconsin 53075 This heavy-duty three-quarter ton pickup, with best-in-class towing and acceleration, is an Absolute Workhorse that's packed with all the bells and whistles the upgrade Laramie trim offers. Ride, interior features, comfort level, and durability are four more reasons to put this truck on your short list if power and performance aren't already enough. This 2008 Dodge Ram 4X4 pickup benefits twice from the 6.7-liter Straight 6 turbodiesel engine. One benefit is its power: 350 horsepower and 650 lb.-ft. of low-end torque. Another benefit is its low emissions. . It's a 6 speed manual with south bend dual disk clutch with upgraded hydraulics. EGR/DPF deleted. The Mega Cab focuses on passenger comfort, seating six in two rows, with reclining rear seats and 44 inches of legroom. That's not all...With this Laramie trim you get Navigation, S, Leather Upholstery, Heated Front Seats and the list goes on! This Dodge delivers in spades with "big rig" power, styling and capability. Never Worry about not being able to get it done with this truck! Print this out and hurry in for a test drive today before it's gone!! Here's a list of the things that the truck has: 35x12.5 toyo open country m/t tires 20x9 fuel offroad wheels 5% window tint all the way around including eyebrow on windshield Weather tech rain guards on all windows LED interior lights LED Recon tail lights LED Recon cab lights Tekonsha trailer brake controller 5 inch exhaust Spray in bed-liner Undercoating (done by ziebart) Band;W turn over gooseneck turnover ball Air dog 150 lift pump All new brake pads and rotors within the last 15k miles New injectors at 66k miles replaced with Exergy 30% over injectors Exergy performance sportsman injection pump (replaced at 66k miles) Fleece fuel filter delete Borg Warner S468 turbo with engineered diesel billet wheel ARP head studs Fuel tank sump kit Fleece performance coolant bypass kit EFI live with 5 position switch and CTS2 monitor Hamilton 103lb HD valve springs Hamilton HD pushrods HTT 2nd gen stainless manifold All upgrades and work were done by Wehrli Custom Fab at 66k miles. Seller has all receipts for everything. Interior is 10/10 and body has absolutely no rust. Oil changed every 5k miles with Schaeffers oil. Truck runs and drives flawlessly and turns heads along the way! This truck is a must see and drive! Call (402) 502-8385 for more information.